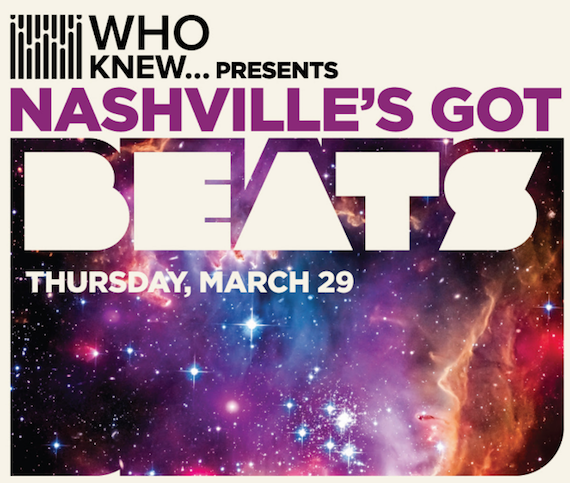 Who Knew Presents will explore Nashville’s hip-hop scene in an upcoming panel titled “Who Knew…Nashville’s Got Beats,” to be held Thursday, March 29 at Nashville’s City Winery. Grammy award-winning producer Jim Jonsin will be interviewed by music manager and A&R exec Iain Pirie. The panel will also include Tamara Coniff (Exec. VP Music Publishing/Business Affairs at RocNation), D’llisha Davis (2L’s On A Cloud), Tyke T (artist/songwriter at DrivenByMusic Ent), Torrance “Street Symphony” Esmond (producer/music executive), Dan Weisman (artist manager at RocNation) and Patrick Sabatini (entertainment attorney at Serling Rooks Hunter). The evening will also include performances from Littlefoot, as well as Tim Gent & Case Arnold. Doors open at 5 p.m., with the program beginning at 6:30 p.m. Tickets are $15 (early bird), $20 (beginning March 1) or $25 at the door. To purchase tickets, visit citywinery.com/nashville.